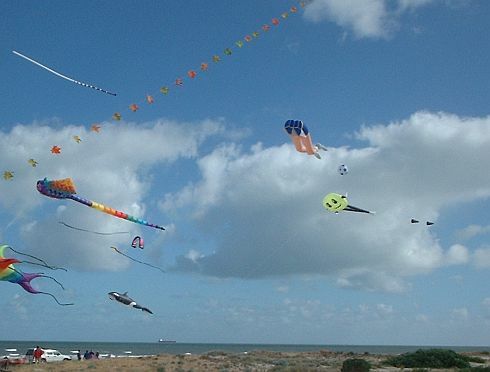 This site has published quite a number of kite images from the Adelaide International Kite Festival. Each year I take a different approach to presenting a photographically-illustrated account of the event. 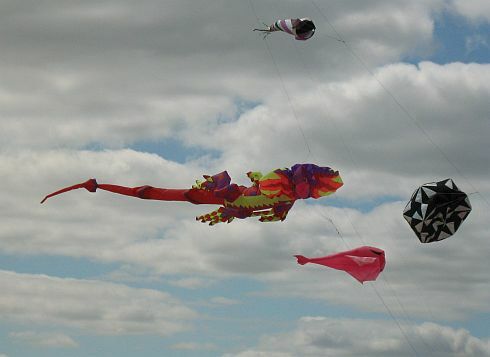 This page is simply an attempt to pull out a number of interesting but previously unpublished kite pictures covering the entire period my family has been attending the event. Up to 2011 anyway. Just a small number of images are presented for each year the festival was held, but I have been more generous with the sizes this time. 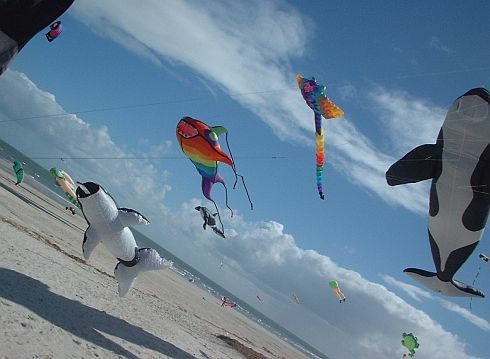 Due to jetty renovations, no festival was held in 2010. Also, in 2009 all imagery not already published was unfortunately lost in a hard drive crash. 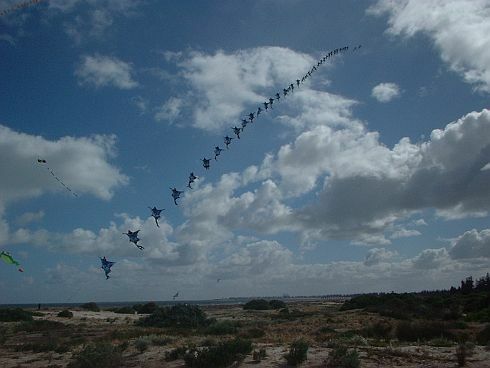 We had backups for the other years. Our camera in 2007 was originally bought for around $400 some years previously. 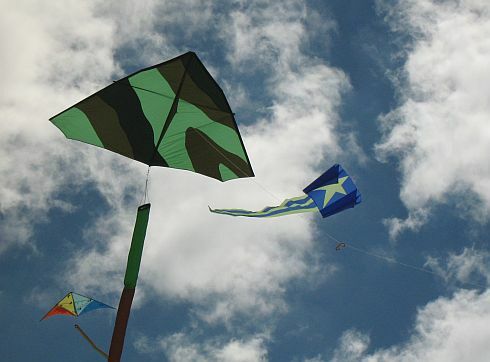 And it was quite pathetic compared to current models in both resolution and capturing color! 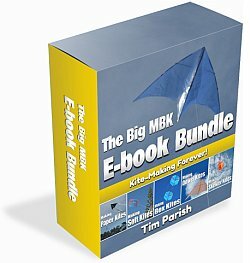 Our Big MBK E-book Bundle has extensive instructions for home-building kites of many types and sizes. A couple of these are on a tilt. 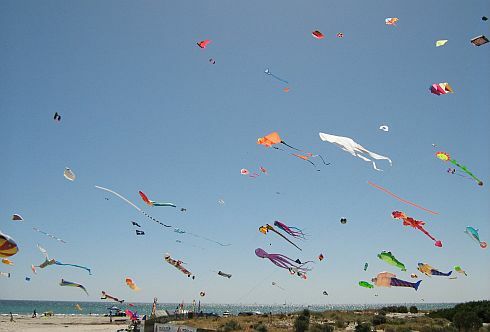 This is a technique my wife favors for taking kite photos. In fact she may have taken all of these, although I have cropped them a little. This was the old camera. 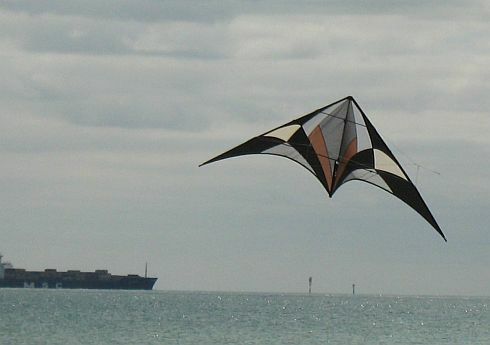 The following sequence of photos starts with a close-up of an unusual kite design. 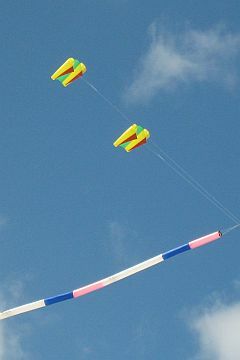 It shares some similarities with a Rokkaku, but has curved leading and trailing edges, and quite a few light horizontal spars. Interesting! 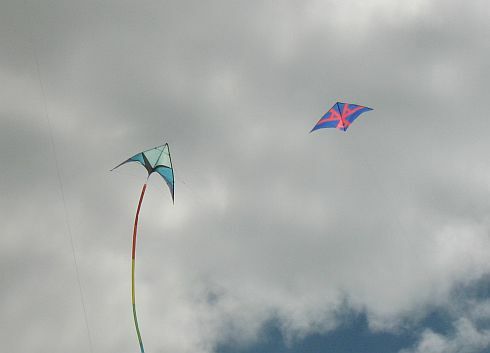 A fairly random selection of shots here, including a couple of stunt kites for a change. I'm hardly ever satisfied with the shot as originally framed. 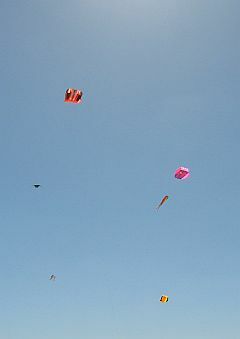 Hence most of these are cropped down to improve the composition and sometimes to highlight detail in the kites by enlarging them a bit. 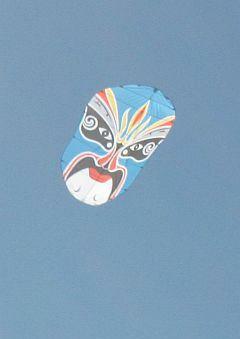 I was concentrating on zooming in on a high-flying kite. KA-CHEESH (fake shutter sound, sampled from a real camera) ... BZZZZZZUP (noisy cheap zoom mechanism) ... KA-CHEESH KA-CHEESH (rotate to portrait orientation) KA-CHEESH KA-CHEESH KA-CHEESH ... BZZZZZZUP. Pausing for a moment, I looked across to see the same guy, giving me a slightly bemused look... Was he thinking 'so much enthusiasm, what a crappy camera...' I don't know, and never will. 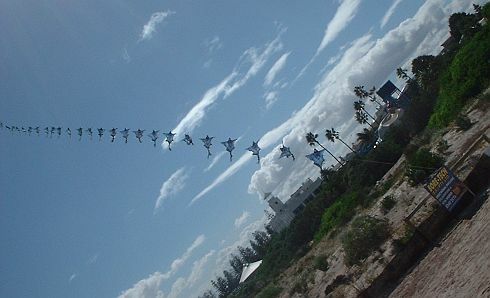 One day we will invest in a more capable camera! 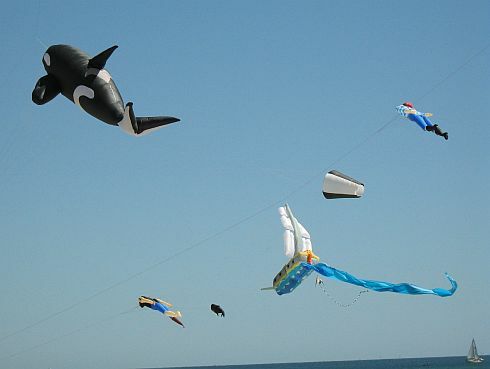 We will continue to add to the sum of interesting kite photos on the Web. 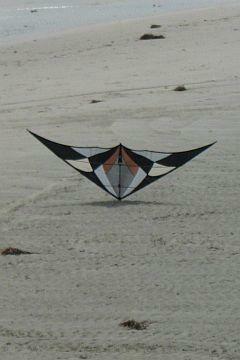 It's fun to photograph your own kites from time to time too. I've been re-creating the classics for many years. For example, diamonds and deltas.